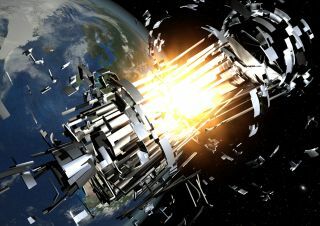 Human spacefarers and satellites constantly dodge a cloud of dangerous debris left over from orbital traffic accidents and launches. Now the European Space Agency has taken its first steps toward creating its own space surveillance system that could track thousands of objects per second. One such step takes the form of demonstrator radar that will eventually lead to a system capable of tracking 15,000 to 20,000 objects on the radar for at least 10 seconds each day. Having such awareness represents a necessity when even the tiniest space debris can destroy satellites or cause serious damage while traveling at speeds of 17,400 mph (28,000 kph) – not even space glue could salvage the situation. The radar technology must also be able to track debris particles just a few centimeters in diameter. Fraunhofer researchers plan to focus on designing the receiver array for the radar, while a Spanish company called Indra Espacio builds the transmitter. Indria Espacio holds the demonstrator radar contract from the European Space Agency (ESA) worth $2 million (1.4 million euros). European space missions currently rely upon the U.S. Space Surveillance Network to track the smaller pieces of debris in their path. ESA is setting the stage for the European version of such a system to take shape between 2012 and 2019. Just how the European system would fit with U.S. tracking capabilities remains unknown, but keeping electronic eyes on space is necessary if humanity hopes to harness space solar power or launch interplanetary missions that can travel safely in space.